You see a street. I see the most beautiful sight that my eyes have ever witnessed. This photo, taken just a short while ago on the Boston University Bridge that connects both East and West campus for Boston University as well as Boston to Cambridge, shows the handicap ramps on the bridge freshly resurfaced. When I say “freshly” I mean exceedingly fresh – like, less than three hours old. The BU Bridge has long been my enemy. In the warmer three seasons it is simply an annoyance. It is beyond beaten up. Potholes are an issue for people that don’t use wheelchairs, let alone myself. It becomes a potential tripping hazard and, in my case, a potential cause of a wheelchair crash. That’s just when it’s sunny outside. In the winter this thing is pure evil. It may actually have a personal vendetta against me. This pathway is the only one that allows me to cross from my dorm to classes every day. During this insane winter I was repeatedly snowed out of class because this bridge had been choked off by snow like an artery choked by cholesterol. A steady diet of sun and salt, oddly against my cardiac analogy, was the only solution. In the process the bridge, especially the ramps I need to take daily, were damaged by shovels, plow, and general weathering. I’ve recently been able to traverse the bridge again, but it remained a, now lessened, safety risk. Nothing to keep me home, but certainly something to be conscious of. It wasn’t just me being cautious about it this winter either. Everyone I talked to either knew someone, heard of someone, or personally slipped on the bridge. This, in turn, led to the wonderful people of The Bunion, BU’s satirical newspaper/website, to publish the following just today. 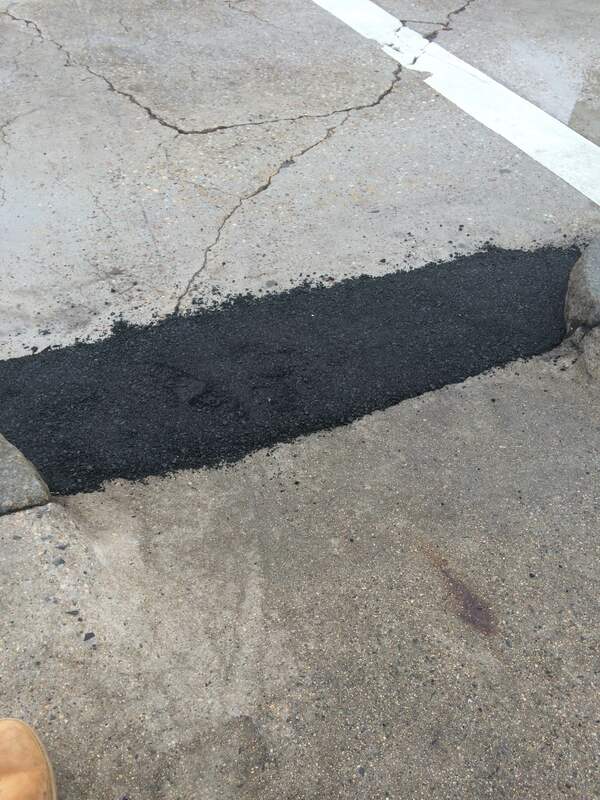 However, much to my surprise and sheer bliss when I was returning home to my leftover food in my fridge just moments ago I found that someone, possibly Massachusetts public works, maybe Tom Brady, had not only fixed the damage that the winter had on my bridge, but fixed the safety risk for my chair entirely. This means that I can once again walk over the bridge without having to take special attention to the ramps. To say I’m happy is an understatement. I’m overjoyed. This is incredible. This winter was and is the most crazy I have ever lived through without any close second. The bridge became the running issue for me, not the snow. Boston University does not control it, the city does. 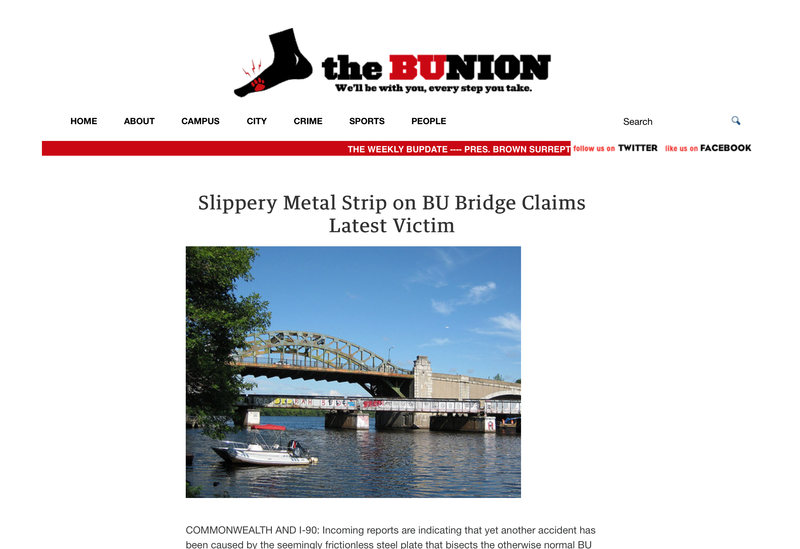 This meant that while BU was plowed clear enough that you’d think it was August the bridge remained an issue. With this fix I can get back to normalcy. It’s about time. I don’t know who to properly thank, but if I can ever find them there’s a dinner on me waiting. If you look after me I will look after you. This is a blessing, no matter how ridiculous it might sound.